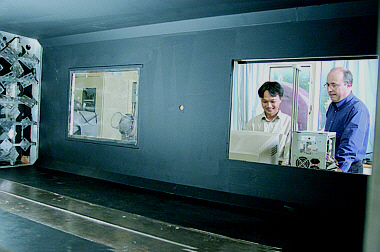 Professor Charles Meneveau, right, and doctoral student Yi Li inspect a Homewood campus wind tunnel, where turbulence experiments are conducted. To most people, turbulence is the jolt felt by jet passengers moving through a rough pocket of air. But to scientists, turbulence is the chaotic flow of a gas or liquid in which parts of the current curl into irregular, ever smaller, tight eddies. It's a very common phenomenon that can affect weather conditions, greatly alter the movement of pollutants, dampen a vehicle's speed or play a role in the way chemicals mix and combustion engines perform. Yet the phenomenon is difficult to understand, and scientists cannot easily predict how a turbulent flow will behave. While working on this problem, researchers at Johns Hopkins have discovered a new mathematical formula that could lead to more precise computer models describing turbulent flow. Charles Meneveau, who last week was named the Louis M. Sardella Professor in Mechanical Engineering, and Yi Li, a doctoral student in the department, unveiled the formula, called the "advected delta-vee equation," in a paper published Oct. 14 in the journal Physical Review Letters. "This equation gives us a mathematical shortcut to describe a complex characteristic of turbulence called intermittency," said Meneveau, who also is director of the Center for Environmental and Applied Fluid Mechanics at Johns Hopkins. "It solves just one piece of the overall turbulence puzzle, but it's a very important piece." Intermittency refers to abrupt, very concentrated changes in the speed of a moving fluid. If the velocity of a fluid is plotted on a graph, these changes look like sharp drop-offs or cliffs rather than smooth, gentle slopes. These sharp changes are said to be intermittent because they occur infrequently within a turbulent flow, but when they do, they can be quite violent. This characteristic has been particularly tough to include in computer models of turbulence because representing it numerically requires a huge number of calculations and a mammoth amount of computing power. "Conceptually, we could do it," Meneveau said. "But it's not practical." Meneveau and Li devised a shortcut by tracking two particles as they moved with a turbulent flow like two balloons tossed along by a gust of wind. The resulting equation gave them a tool to predict intermittency by merely solving this simple equation rather than having to solve complicated computer models of turbulence. "Ultimately, we believe this will help researchers put together more precise models that could be used to predict weather patterns, movement within bodies of water and even some turbulent events that take place within an internal combustion engine," Meneveau said. "Astrophysicists are also interested in this because, for instance, magnetic fields in interplanetary space demonstrate turbulencelike intermittent features." He and his students have been conducting their own measurements of turbulence and intermittency in a wind tunnel located on the Homewood campus. Wind tunnel experiments allow them to gather data to provide ideas for better computer models and help them verify that predictions from these models match up with real-world results. Funding for Meneveau and Li's research has been provided by the National Science Foundation and the Office of Naval Research.